It is doing John Adams’s Nixon in China next year. But this is risky. These works may be on contemporary themes, but they feature dissonant music. And at the Opera Conference in Vancouver in 2013, a man in the back stood up and said that it was a mistake for opera companies to try to modernize by playing pieces like Nixon in China, since, like all modern operas, there was not one memorable or singable tune in the entire piece. I looked across the room and caught Kent Devereaux mouthing the words News news news news, matching exactly what I was thinking, along with the now-part-of-the-standard-aria-repertoire piece I am the wife of Mao Tse-tung, which consists almost entirely of simple triads and the outlinings of those same triads in the melodic line. Next story: when I was a graduate student, I was hanging at my research advisor Al Despain's home, a brilliant man with simple musical tastes, one who listens to what he likes, and he was at that moment playing some music he liked, some light jazz, some jazz with a touch of the electric, maybe a bit of rock fusion, music I thought simple and straightforward to listen to, and I attempted to join with him in the clear enjoyment of his simple musical pleasures. Whereupon, one of his other students entered and said What is this, John Cage? An even earlier story: when my college roommate and I were both taking various composition classes and raiding the local record stores for music that pushed the edges of the world we had known, I picked up a copy of Pierrot Lunaire, and that first time I listened it to I found it very strange and unappealing, mostly the vocal style, but really almost everything about it, and I thought to myself, when I eventually love this music, which I somehow knew I would, I will have to remember this moment, and remember how far my tastes have traveled, how distant they are from even those of other sophisticated listeners, as I was, having for many years listened to just about everything I could get my hands on. But all this, and the conclusions therefrom, are obvious. When the reviewer said 'dissonant' he just meant unfamiliar. Clearly any kind of semi-scientific Helmholtzian or musico-historical Tenney-ian Dissonance Meter's needle would remain during Nixon in China on the low end of the scale, most assuredly lower than Wagner and lots of popular others. And my fellow student meant by "John Cage" the whole incomprehensible world of music that lies outside of the ten corporate-sponsored tunes of the moment. Is there really music that is inherently popular or elitist? Or is it all just about what the populace is conversant with? If the mass public hears something a hundred times, it can become - by that process alone - likable. If not, then why does each generation seem to love the music they grew up with and find the music of the succeeding generation unapproachable? Why do those growing up in different cultures by and large love the music of their own culture and find the music of other cultures incomprehensible? Clearly popularity is learned. So, when one is asked take the audience into account, one has to respond, which audience? Not me, obviously, as my tastes have long since departed this realm. And if I am not the audience, then how can my tastes be relied upon to judge whether other audiences who are not me might respond? Almost surely I'll get it wrong. There is nothing sadder than the composer who gives up her own tastes and desires to attempt to connect to the audience and who fails in this attempt. Oh to be a composer most fortunate - financially fortunate - whose musical tastes happen to coincide with that of the largest and most well-heeled audience. As I was just telling Beth Levin a few minutes ago, there are few dynamics and few indications of tempo, but they are flexible. 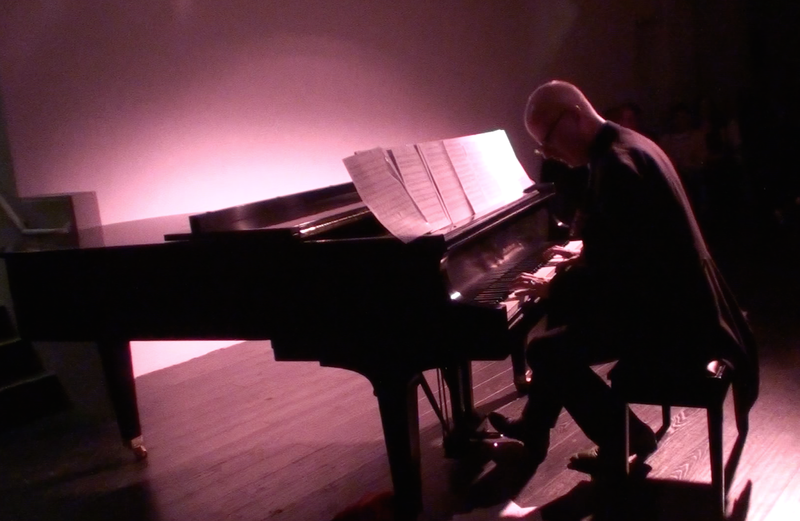 I personally played the first piece moving the soft pedal very slowly, and in synchronization with my own small dynamic movements, giving the feel of an organ crescendo pedal. The third piece can be even slower than indicated, and quieter, and una corda. The last should have some frenzy, wide dynamics fine, a caesura before the change to the soft part. Kyle Gann has spoken about this on his blog - the skepticism of the new music community at music they perceive to be understated. I thank him his clarity on the issue. And yes, I agree with him. I'm happy if someone tries to control every aspect. I myself used to do tape music, and that's a highly controlled medium, except for wires and speakers and amplifiers and the room in which one listens, but I also think that performers - including myself - should be able to mangle my pieces any way they wish. They do anyway, so why not just acknowledge it?